A buzzword, part of a revolutionary chapter in history and, supposedly, a ‘must have’. But what does IoT really mean? Well, that depends on where you’re sitting. In Making Sense of IoT, Kevin Ashton outlines the meaning of IoT as the connection of sensors to the Internet, behaving in an Internet-like way by making adhoc connections, sharing data and allowing unexpected applications so that computers can understand the world around them and become humanity’s nervous system. Most consumers experience, or perceive, IoT through connected wearable devices and smart home applications, but there’s a growing popularity for businesses to become IoT’d. While the term is broad, the applications are endless for businesses but it’s only once there’s an understanding of what the technology is that it’s true potential can be unleashed, transforming our working worlds as we know them. Lost? You’re not alone. Perhaps an easier way to define what IoT is, is by looking at what it isn’t. Earmarked as a notable topic of conversation in 2014 by Forbes it was, in fact, way back way back in 1989 that a connected toaster was unveiled by John Romkey. Whilst IoT technology can be used to lay a foundation for the generation of it, it isn’t Big Data. Structured or unstructured, it’s not the pools of data that are important. It’s the detailed insights that can be drawn from it that makes it so valuable. It brings with it a few problems if proper thought isn’t given to the data that is generated, and why it’s generated. Read more about that here. Typically, when people hear that they need new technology, they brace themselves for big bills. The thought of new technology invokes fear as images of halted production flood to mind as expensive systems are ripped out and replaced with shiny new ones. If there’s one thing that sets IoT.nxt apart, it’s our ability to implement quickly, incorporating all existing technology and asset investments with minimal disruption to ensure that our clients are able to show quick ROI. In fact, properly applied, it can augment and enhance departments company-wide, from marketing to finance, increasing productivity and optimising expenditure. Industrial applications of IoT, dubbed IIoT, is a market with infinite possibilities and a steep growth curve. 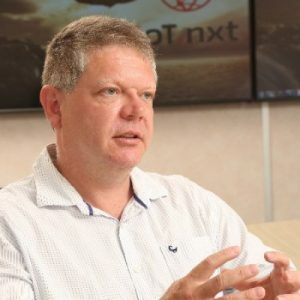 IoT.nxt CTO, Bertus Jacobs, says the commercial applications of IoT are infinite and we haven’t even begun to unlock its true potential. If it’s implemented with a ‘gentle touch’ or ‘overlay’ frameset in mind, IoT absolutely isn’t something to fear. The converse – a ‘heavy handed approach’ would be one where an entire business has to adapt to a specific IoT vendors’ requirements, including ‘rip & replace’ of existing technology. Enable the trillion permutations of connections between ‘things’ – be they devices, sensors, systems or platforms. Support the consolidation of all ‘things’ into a single view or dashboard, and it needs to serve as a bridging platform for other IoT and closed loop applications, without extensive bespoke development. Above all, it must provide real-time visualisation and normalisation of data, and enable the remote deployment of strategic changes based on insights gathered. At least according our definition, anyway. Still confused? You’d better mail us. It was no coincidence that Bertus Jacobs ended up in a career that involved computers and the development of ground breaking technology. An early interest in gaming and some persuasive skills saw a Commodore VIC 20 enter his life circa 1983. From then on, Bertus’s focus shifted to optimising his gaming catalogue – by developing a program to organize the piles of floppy discs he had collected – and having his mom hide his computer cables so he could get a bit of studying done to get through school. It wasn’t until he saw his “Word Processor” on the cover of Commodore magazine, naming him “Programmer of the Month”, that he realised that this was something he could make a career out of. Straight out of school, Bert headed off to the University of the Free State to do a BSc in Computer Science and Quantum Physics, and further to completing an Honours degree with a focus on computer networks, encryption and computer graphics. After weighing the option to continue studies, he then decided to enroll in an MSc in Natural Language Processing. 25 years of practical experience and a few successful ventures later, the on-hold MSc is no longer needed, and Bertus is the Chief Technology Officer at IoT.nxt. Ever calm on the surface, his mind is constantly searching for new trends, tricks and techniques, and imparting these onto his team of developers. It’s evident in his unusual office hours and literal ‘always on’ approach that Bert has optimised his output to require very little sleep, but the joy that comes from seeing his hand-plucked developers turn ideas into mainstream realities is well worth it. Bertus is not one for stuffy corporate culture – perhaps why he is the proud co-custodian of the Beer O’Clock Bell. He’s a tech man through and through, spotting bottlenecks and potential breaks in projects well ahead of others – a great skill to have on board when trying to disrupt a market and pioneering the 4th Industrial Revolution, don’t you think?